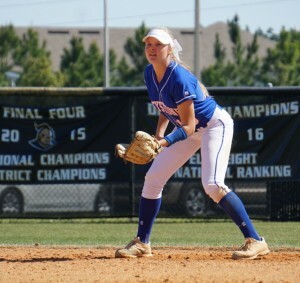 The Trophy Shop Athlete of the Week for the week of April 1 is ASHTON LUDWIG* of the Keystone Heights softball team. *The junior helped lead the Indians to a fourth-place finish in the Gold Division of the prestigious Kissimmee Klassic. Ludwig started out on fire in the tournament. She was 5-for-5 with four runs driven in as Keystone Heights defeated Riverview, 8-3, in its opening game. Ludwig followed that up by going 3-for-3 with two runs and an RBI in a 7-0 win against Frostproof. She finished the tournament with a .643 batting average in four games. Davis, who transferred from Gainesville to Oak Hall this season, set a Florida Relays high school record in winning the 100-meter dash in 11.27. The time was also the best in the nation and the seventh fastest time in the world. Her time lowered the previous best of 11.29, which she tied last year. Grant won two events at the Alachua County Track & Field Championships at Santa Fe High School as the Buchholz boys won the team title. The junior took first in both the 110 hurdles (14.89) and the 300 hurdles (43.14). He was the only Bobcat to win a pair of individual events for the Buchholz boys, which totaled 172 points, ahead of Oak Hall with 106 and Gainesville with 104. The junior had a monster week in leading the Tigers to a pair of victories. She began the week by going 3-for-6 with 6 RBI in a 27-11 win at Williston. Two nights later, Clark went 4-for-5 with a double, a triple and 9 RBI in a 22-12 win against Branford. In addition to the 15 runs that she drove in, Clark also scored four times, accounting for 19 runs in the two games. Smith-Jackson placed fourth at the FHSAA Class 3A state meet, the best individual area showing at state. The senior also placed second at both regionals and the 3A-District 1 tournament, and he took first at meets such as the Westside Kiwanis in Jacksonville and the Hagerty IBT in Oviedo. He was named the Gainesville Sun’s Wrestler of the Year. McHenry helped lead the Lady Tigers (27-3) to their first girls basketball state title since 1980. The senior just missed a triple-double in the championship game. She finished with 10 points, nine rebounds, and nine steals in the 43-31 win against Holmes County in the Class 1A Final at the RP Funding Center in Lakeland. She had a double-double in the 60-40 win against Port St. Joe in the state semifinals. McHenry scored 14 points and tied a game-high with 13 rebounds. She finished the season second in scoring at 14.3 points per game, just seven points total behind fellow senior Taniah Bowers, and she led the team in rebounds (7.5 per game). The Jacksonville University commit was 2-0 with a complete-game no-hitter and an 8 inning 2-hitter. She combined for 34 strikeouts in 15 innings pitched. At the plate, the junior was 3-for-8 with a double and 2 RBI, including the game-winning hit (a double with runners on 2nd and 3rd) in a 3-1 extra inning win at Santa Fe (Alachua). Humphrey struck out 18 Raiders and accounted for all but six outs. The junior helped lead the Tigers to their first district title in 19 years by averaging 12 points, seven assists, 1.5 steals, and he was 10-of-12 from the free throw line in two games. In the 7A-District 4 semifinals, Jones scored a team-high 13 points, including seven in the final quarter, in a 61-51 win against Forest (Ocala). He added seven assists, eight rebounds, one steal, and was 5-of-6 from the free throw line. In the championship game, a 61-51 win against top-seed Gainesville, Jones scored 11 points, dished out seven assists, grabbed three rebounds, collected two steals, and he was 5-of-6 from the free throw line. The 15-year-old benched a state record 360 pounds, breaking the state mark by 55 pounds, and that coupled with her 185 in the clean-and-jerk gave her a state record total of 545 pounds in the unlimited division. Reeves’ win gave the defending 1A state champions two first-place finishes, as Union County finished fourth at the FHSAA Girls Weightlifting Finals at Arnold High School in Panama City Beach. The junior combo guard helped lead the Blue Wave to a 2-1 week. After scoring 17 points and grabbing four rebounds in a home loss to 6A No. 2 Eastside (Gainesville), Speer scored 22 points, had three assists, four rebounds and four steals in a 65-55 upset win at Class 3A No. 1 Orlando Christian Prep. But he saved his best for last. Speer scored 32 points and grabbed six rebounds, and he hit the game-winning free throw with no time on the clock, in a 54-53 win at defending 1A state champion Wildwood. Bradley helped lead the Rams to a 3-0 week. The junior guard scored 13 points and grabbed five rebounds in a 57-41 win at Williston to start the week. He followed that up with 14 points in a 41-40 win at Santa Fe (Alachua) and finished the week with 14 points in a home win against St. Francis Catholic Academy (Gainesville). Bradley, who finished the week with 11 rebounds, was the only Rams’ player in double figures in all three games.